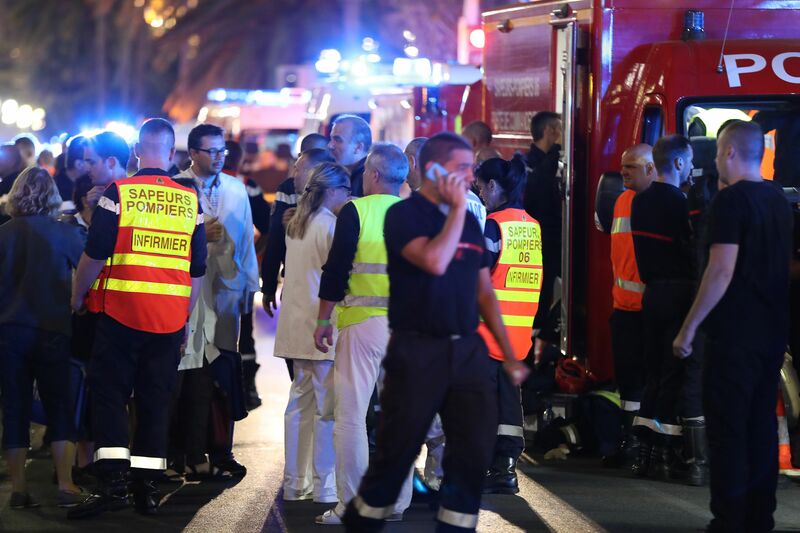 Update: According to the latest reports, at least 84 people were killed in the attack in Nice, France, and over 180 are injured. Of the wounded, François Hollande, the president of France, said on Friday there are 50 victims “in between life and death." After an emergency meeting of French security and defense officials, Prime Minister Manuel Valls said: "Terrorism is a threat that weighs heavily upon France and will continue to weigh for a long time. We are facing a war that terrorism has brought to us." Among the victims, who were celebrating the French holiday of Bastille Day, were a number of tourists, including two Americans, Sean Copelend and his 11-year-old son, Brodie. To help victims of the Bastille Day attack, you can contribute to verified fundraisers or donate blood. Earlier: On Thursday evening as the French national day, Bastille Day, was nearing its end, a truck purposely plowed into a crowd of people gathered to watch fireworks on Promenade des Anglais in Nice, France, reportedly killing at least 75 people and injuring 65 more, according to ABC News. In response to the devastating terror attack, Facebook has activated its safety check feature for users who are located in the vicinity of the crash. If you are concerned about friends and/or family in France, how can you use the Facebook safety check feature to see if your friends in Nice, France are OK? There are three ways that you can use the feature, launched globally in 2014, to check on the well-being of your Facebook friends. If friends nearby have marked themselves as safe after they are prompted by the site, "[Friend's Name] was marked safe during The Attack in Nice, France" will appear as a post in your news feed. Secondly, when you log into your personal account, you will receive individual notifications each time a Facebook friend has used the feature to report on their safety. Finally, you can follow this official Facebook link to see a list of your friends who are currently in France, and which of those friends have marked themselves as safe. Bustle will be updating reports on the Bastille Day crash and its victims as more information becomes available, and in the meantime, here is how you can help the victims of this attack, no matter your location.